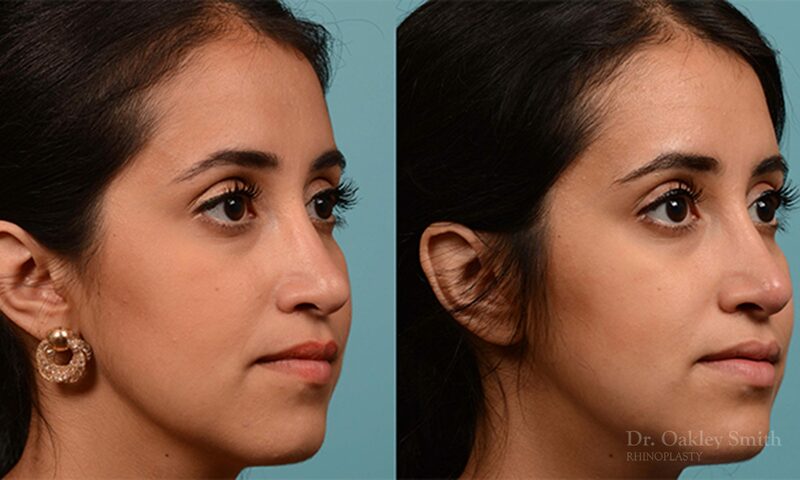 Our lovely young female patient had undergone primary rhinoplasty three years ago. Unfortunately the internal functional component (septoplasty) failed to make any difference in her blocked nasal breathing. The only cosmetic change she noticed was her nasal bump was gone. A year later she underwent a revision rhinoplasty. Again unfortunately her appearance wasn’t improved and her breathing in fact got worse. Analyzing her before nose shows she has poor tip definition. The tip is too round on profile and isn’t rotated upwards sufficiently to be attractive. She continues to have a slight curvature towards the left. Her columella (the fleshy part below her tip and between her nostrils) is mildly retracted at the junction with her upper lip. She was offered three options. She could undergo yet again another revision rhinoplasty. Either rib or ear cartilage could be chosen. Before coming to her consultation, she assumed some form of grafting surgery was going to be needed. 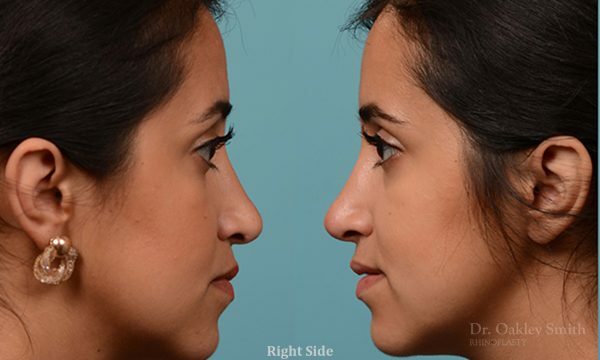 The third option offered by Dr Oakley Smith was an injection rhinoplasty. She was not aware of this and was surprised. Dr Oakley Smith went over the risks and benefits of her options. Rhinoplasty using rib cartilage surgery had the possibility of greatest improvement, but was the most expensive and invasive. 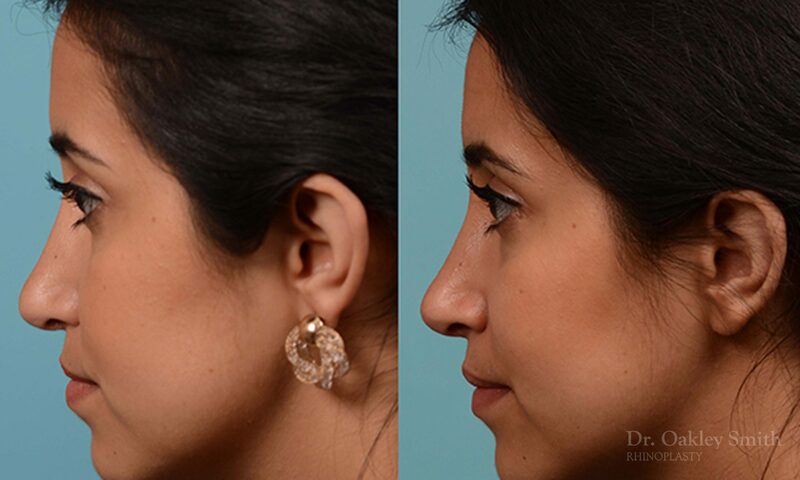 Rhinoplasty with ear cartilage was less expensive, but the degree of improvement was slightly less. Both had the same length of recovery (two weeks). Injection or liquid rhinoplasty had the advantages of being the least expensive, the greatest degree of precision and therefore probability of success, and no recovery time. However it wasn’t likely to be permanent and her breathing would remain unchanged. After a bit of discussion, she agreed to try injection rhinoplasty. The results were better than expected. 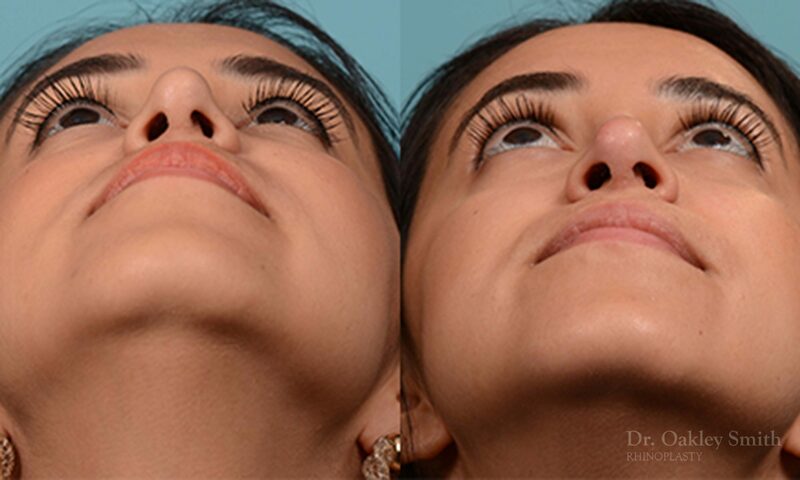 Her tip has been projected, it has better definition, the columellar retraction is improved which helped create tip rotation and her bridge was made straighter. 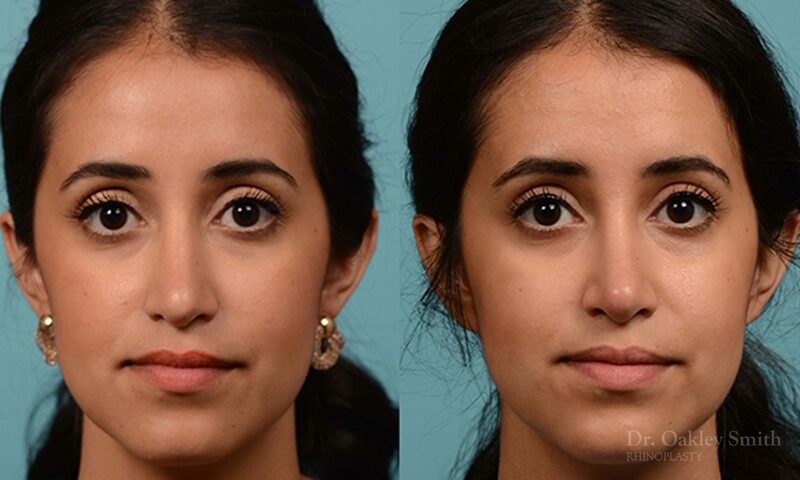 Injection rhinoplasty is often a good option for people who unfortunately have undergone several unsuccessful rhinoplasty surgeries. It should be performed only by a very experienced practitioners, as damaged, scared tissue increases the risk of causing skin necrosis and death with a resulting visible scar for life. 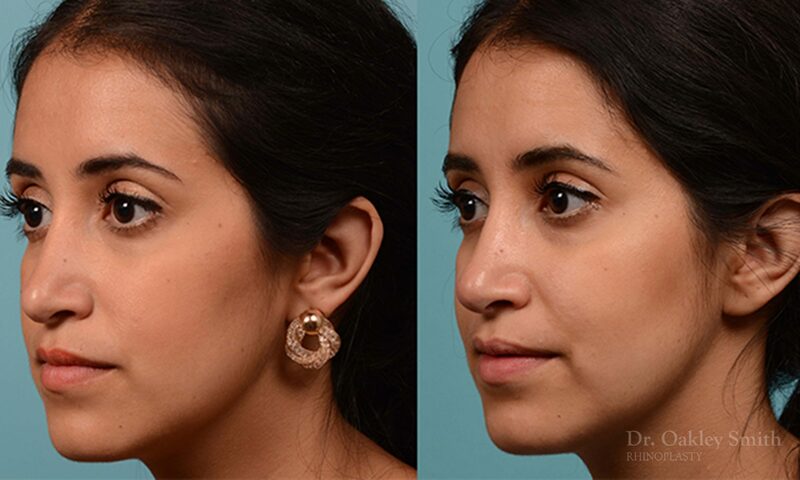 Before and after rhinoplasty photographs of Dr Oakley Smith, a Toronto rhinoplasty expert.